Phenylketonuria (PKU) is a hereditary metabolic disorder. Persons with PKU cannot break down the amino acid phenylalanine (Phe), which is an integral component in all animal and vegetable proteins. This condition is caused by a malfunction of the enzyme called phenylalanine hydroxylase (PAH), which is normally responsible for converting phenylalanine to another amino acid called tyrosine. 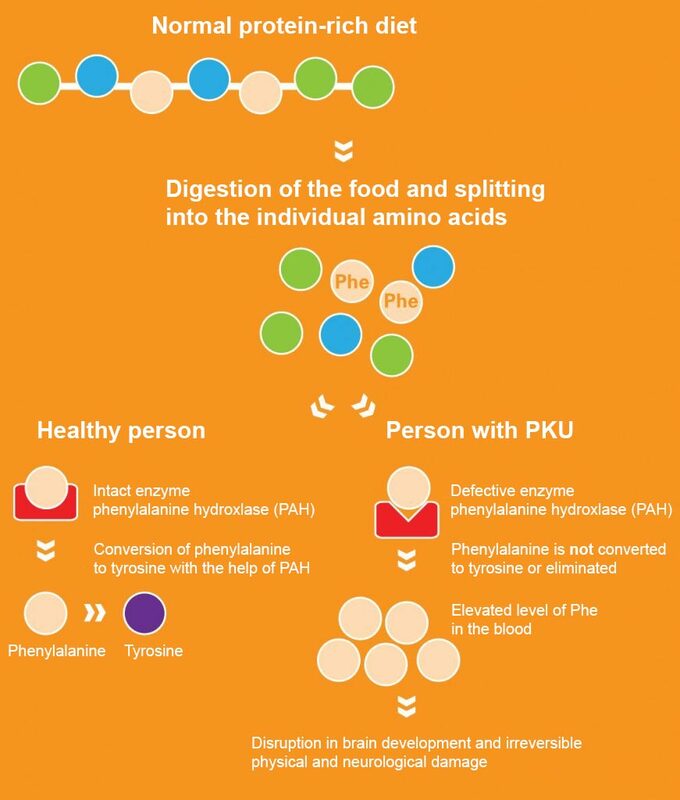 When the PAH enzyme is missing or is not working properly and a normal diet is adhered to, high levels of phenylalanine build up in the blood. If this is not treated, it leads to problems in the development of the brain and to irreversible physical and mental disabilities. However, if the diet of children affected by this disorder is adapted properly, the children will stay physically and mentally healthy as they develop and can lead a normal life. Of the 82,000 children born in Switzerland annually, four to five are born with PKU. The metabolic disorder PKU was discovered by the Norwegian physician Ivar Asbørn Følling in 1934 when he found that the elimination of phenylalanine was disrupted in intellectually disabled children. Twenty years later, the German professor Horst Bickel, together with other researchers, developed a low-phenylalanine diet that facilitated the reduction of the level of phenylalanine in the body. HOW DO YOU GET PKU? There are always two copies of genes in human cells, as one copy of all genetic information is passed on by the mother and one by the father. 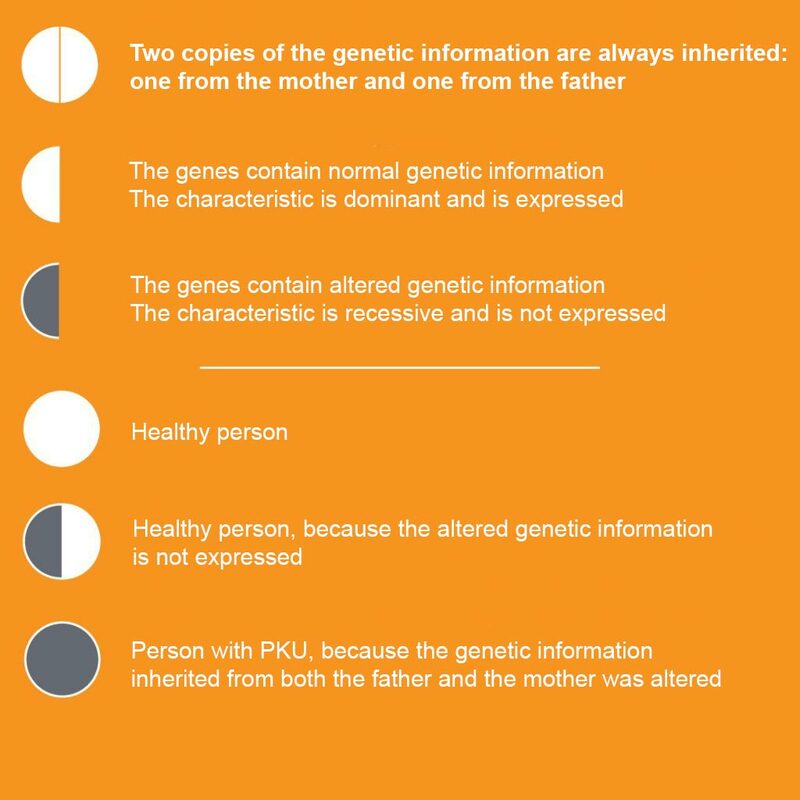 Whether the genetic information from the mother or that of the father is used in the development of the child’s body depends on the characteristics of the genetic information. If the gene is recessive, this characteristic is suppressed and does not appear. However, if the genetic factor is dominant, this characteristic is expressed. The mutant gene responsible for the development of PKU is recessively inherited. This means that the disorder appears only when the child has inherited the PKU predisposition from both the mother and the father. 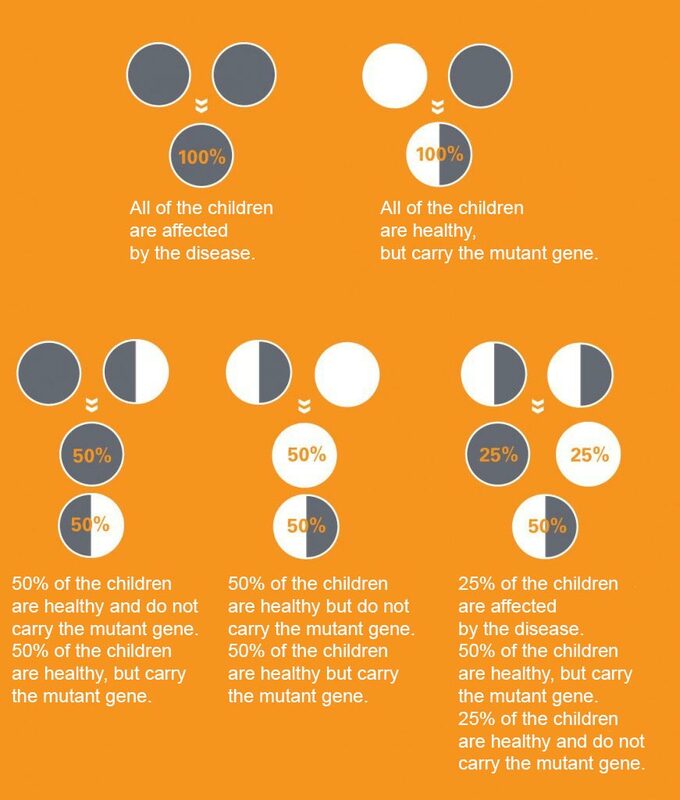 We can assume that in Switzerland approximately every 70th inhabitant is a carrier of the gene that causes PKU. In the early 1960s, the American Robert Guthrie developed a test for the early detection of phenylketonuria, which is thus known as the Guthrie test. This test has been an integral part of neonatal screening in Switzerland since 1965. It is carried out in the first few days after birth by taking a blood sample from the infant. If PKU is diagnosed in an infant, a precisely controlled low-phenylalanine diet must be started immediately. The amount of protein is reduced so that only as much phenylalanine is ingested as the child’s metabolism can break down. To ensure that the low-protein diet does not result in deficiencies, the diet is supplemented with a phenylalanine-free mixture of amino acids that also includes vitamins, minerals and trace elements. The child’s development is continuously monitored and the phenylalanine levels are regularly checked with blood tests. This ensures that the diet is continuously adapted to the needs of the growing child. If the children adhere strictly to their diet, they will stay physically and mentally healthy as they develop. In addition to the low-protein diet, there is a medication with the active substance sapropterin that can compensate for the missing breakdown of phenylalanine. However, only 30% of those with PKU respond to this medication and the increase in phenylalanine tolerance varies greatly among individuals. As a rule, treatment with sapropterin does not enable persons with PKU to give up their low-protein diets. However, the medication can make things a lot easier by reducing the need for very strict compliance with the diet.